We have recently been through the weeks of hype and hooha that always surround a Royal wedding. I’m not one who gets very excited about all things Royal, but I had to watch it to prepare for the questions I’ll get at the next wedding celebrants’ training course I teach, and as Royal weddings go, this one was rather more interesting than most, both liturgically and symbolically. One of the reasons that the monarchy is so popular both as a political system and as a celebrity obsession is that it functions as a reassuring sign of social stability. This is often one of the main arguments employed by those who argue for Australia retaining the monarchy. Elected politicians come and go, but the monarchy stands firm as a stable foundation. A second reason that the Royal family is so popular is precisely because they are a family. Family is important to most people, and so having a family that is the symbolic centre of society is reassuring and encouraging. If you can reassure people that there is genuine stability in our fundamental social institutions, they will sleep easier at night, and for centuries, family and the monarchy have been regarded, usually alongside religion, as our most fundamental social institutions. And attachment and commitment to the traditional structures of family and monarchy are almost the litmus test of being a card-carrying social conservative. If you are a card-carrying social conservative, I’m sorry, but tonight’s Bible readings would not have been comfortable listening for you. 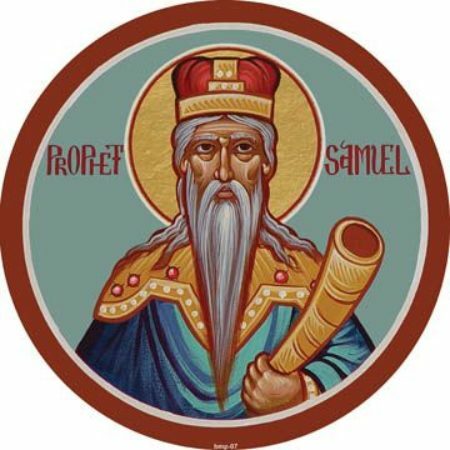 Our reading from the book of Samuel made it quite clear that the establishment of the monarchy was not God’s will at all, and our gospel reading made it quite clear that Jesus did not advocate “family first”. I want to focus mainly on the implications of the Samuel reading’s comments about the monarchy tonight, but the family stuff is connected when it comes to royal families because the crown usually passes along the family line. So Samuel went back to the people and spelt out in no uncertain terms how kings would inevitably become corrupt and would exploit them and oppress them and abuse them. But as God had predicted, the people wouldn’t give up their obsession with having a king, so Samuel got them to sign the legal waiver, and then chose and crowned Saul as their first king for them. Now apart from stating the obvious, that the Bible clearly tells us that monarchy was not the will of God for us but was the result of a refusal to trust in God, I’m not going to give much attention to the implications of this for the modern day system of constitutional monarchy in the British Commonwealth. I am well aware that the Royal family no longer keep slaves and no longer have the power to directly oppress or tax the people, although plenty of tax dollars still go their way. But it remains a system where leadership is not earned but inherited, and therefore it has even less capacity to weed out the corrupt and incompetent than the so-called democracies that seem to be failing us so badly at the moment. I’m certainly happy to acknowledge that the fact that the Royal family has just allowed a descendent of slaves to marry into their ranks is a very positive step in the right direction, but don’t kid yourselves that she’ll be allowed to shake the foundations much further. That’s all I’m going to say about the monarchy. I’m also not going to try to develop a theory of how nations should be governed. It is not my area of expertise, and the ancient world of tribal micro-nations in which this story was set is so vastly different to today’s world that it would be crazy to claim that it tells us how governance should work now. But it does give us some insight into what God thinks we should be capable of, and that certainly has more direct implications for how we structure and function within the small communities that we are a part of, like our families and our churches. What is clear is that God has a greater trust in our capabilities than we do ourselves. God would have preferred that we not set up individuals to rule over us, but that we, as a community, discern and follow God’s will together. God would have preferred that we not create hierarchies and class structures where some are rulers and others are ruled. God would have preferred that we trust God and trust ourselves to be able to live according to God’s will without the need of rules and rulers, and laws and lawyers, and punishments and disciplinarians. And God clearly thinks that we were created with the capacity for that, if only we would trust ourselves, trust one another, and trust God. We were created and called to be a people of great dignity, of great responsibility, of great freedom, living together in a radically egalitarian community under God, loving one another, respecting one another, caring for one another, and serving God and one another together. We were created and called to be a community that carefully and prayerfully listens together to what God is saying to us and through us and among us. We were created and called to be a people who can carry the responsibility for that collectively instead of timidly handing it over to others who then rule over us. But as God said to Samuel, most of the time we are only too willing to opt out. It is very apparent in our own day that most people pay lip service to the idea of participatory democracy, but they are seldom interested in the actual participation part and we will opt to set up hierarchies and be ruled over if we can. We hope for benevolent dictators, but we mostly prefer that it is someone else doing the dictating and that no one is expecting or asking too much of us. The trouble is, as God made clear in the speech he asked Samuel to deliver to the people, once we have delegated our power and so concentrated it in one set of hands, that concentrated power is inherently corrupting. Not inevitably corrupting in every case – there will be leaders of absolute integrity every now and again – but most cases. Power always tends towards corruption, and those leaders that manage to rise above that will always be the exception rather than the rule. The structures and hierarchies that we create to absolve ourselves of responsibility may make our society feel stable and secure, but part of that very stability is entrenched tendencies to corruption; stable patterns of corruption. The biggest factor in the prevalence of abuse cases among Roman Catholic clergymen is not celibacy, as many people imagine, it is the clerical caste system. The culture within the Church, created and sustained as much by the ordinary parishioners as by the clergy, sets the priests apart as though they were not really human and not expected to live with the ordinary needs and relationships and responsibilities and accountabilities that the rest of us live with. And so revered but isolated, misunderstood and inadequately supported, it is a wonder that there are still so many good ones. They have obsessively demanded that we give them rulers to rule over them, says that Lord, and though we warn them of the corruption and oppression and abuse that will result, still they will not trust us or themselves and instead insist that they want rulers to rule over them. And even when they complain about their rulers, and cry out over their corruption and abuse, still they will not hear our call to take up their responsibility together. Instead they ask for new rulers, and then more new rulers, and the cycle goes on and on forever. In our Baptist tradition, one of our founding principles has been the conviction that we are called to be a non-hierarchical community that shares the responsibility equally, seeking to discern the leading of God together in regular prayerful gatherings of the whole congregation. That’s the principle, but it is getting harder and harder to find Baptist congregations who have not replayed this scene from the book of Samuel and handed over the responsibility for leading in the name of God to “anointed prophets” or authoritarian preachers or councils of elders. Our own Baptist Union assembly just a few years ago effectively voted itself out of existence by adopting a new constitution that devolved virtually all power over our denominational life into the hands of a Union Council. We can complain about our leaders all we like now, but we weren’t willing to accept the responsibility and do the work of prayerfully trusting God and discerning together, so we have got what we asked for. My friends, as we continue our conversation in coming months about what membership might mean and how it might be structured here in this congregation, this story is an important one. Because membership structures are not just about who belongs, they are also about how we govern ourselves. I’m very grateful that so many of you say that you think that I do a good job, but this story is warning us that the more you leave to me and the more you ask me to do what you could and should be doing yourselves, the greater the danger that you will corrupt me and diminish yourselves. We can do better than that. We can trust God. We can trust one another. We can trust ourselves. We can be the people God has called us to be. We can, and when we do, not only the structures of politics and governance and membership will fall under the grace of God and be transformed, but even that so-called fundamental institution of society, the family, will be reshaped as a part of the wider community of faithful followers of Jesus, and when Jesus looks around and says, “Here are my mother and my sisters and brothers! Whoever does the will of God is my brother and sister and mother,” that will no longer be said as an either/or but as an all-inclusive both/and. All of us, brothers and sisters, mothers and fathers, aunties and cousins and lovers and friends and elders and juniors and members and guests will standing as one chosen people, one royal priesthood, one holy family together living up to the image of God in which we were created.